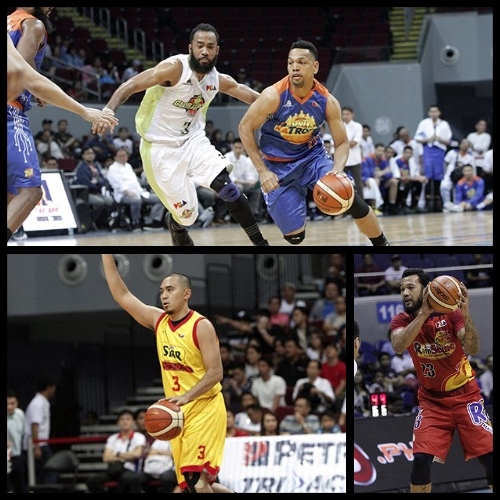 The 2016-2017 PBA Philippine Cup quarterfinals started with a lot of drama as Rain or Shine prevailed in the playoff for the #8 seed while TNT and Star had big victories. The Rain or Shine Elasto Painters ensured their entry into the Oppo PBA Philippine Cup quarterfinals after crushing the Blackwater Elite, 103-80, in a knockout playoff game on Friday at the SMART-Araneta Coliseum. Jay Washington posted 15 points and eight rebounds while rookie Mike Tolomia scored 14 points – all of them in the second half – as Rain or Shine booked the eighth and last spot in the quarterfinal round. Jericho Cruz had a double-double with 12 points and 12 rebounds while veterans Jeff Chan and Beau Belga also finished with 12 points apiece in a balanced offensive attack for the Elasto Painters. Maverick Ahanmisi contributed 11 markers as well. The TNT KaTropa overcame an early deficit before firing on all cylinders to outgun to beat the GlobalPort Batang Pier, 109-101, and take a 1-0 lead in their best-of-three Oppo PBA Philippine Cup quarterfinal series on Saturday at the Mall of Asia Arena. Jayson Castro scored 20 points on 7-for-12 (58-percent) shooting while Mo Tautuaa posted 17 points and nine rebounds for TNT, which trailed by double figures in the first quarter before exploding for a 37-point period in the second. Larry Fonacier also scored 17 points, including five three-pointers, for the KaTropa. Troy Rosario had 11 points and eight rebounds while Matt Ganuelas-Rosser finished with 10 points and a team-high four assists. The red-hot Star Hotshots continued to steamroll through their opponents as they crushed the Phoenix Fuel Masters by 31 points, 114-83, to open their best-of-three Oppo PBA Philippine Cup quarterfinals series on Saturday at the Mall of Asia Arena. Star is now on an impressive five-game winning streak and has won a third straight game by 30 points or more. They defeated Meralco by 47 points and Mahindra by 37 to close their elimination round campaign.